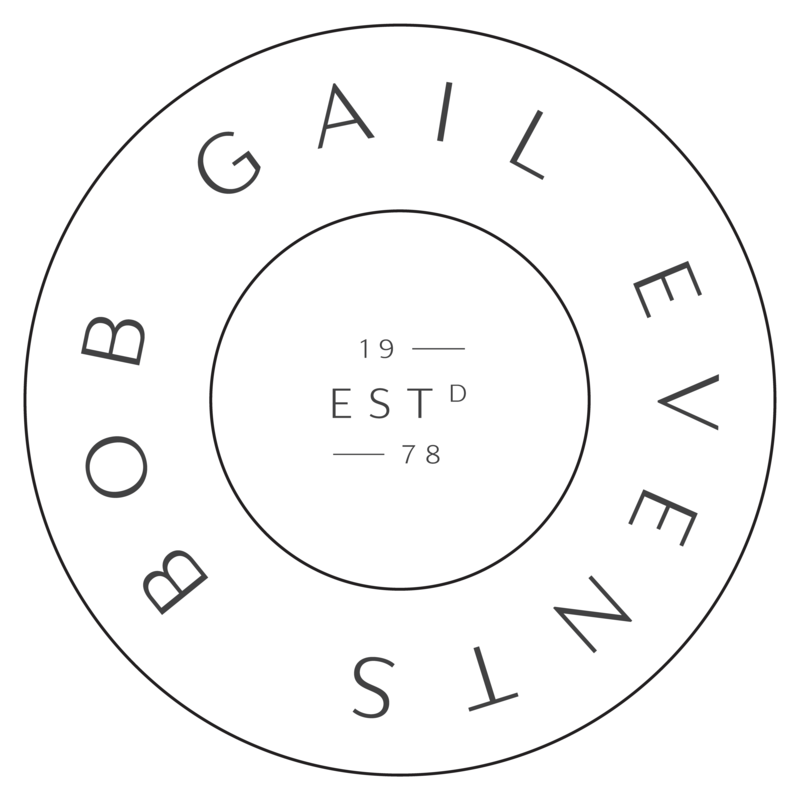 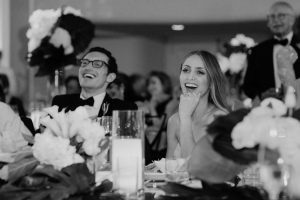 We were so thrilled when we learned that one of our couples, Jenna and Eric, would be featured in the Fall/Winter issue of Inside Weddings. 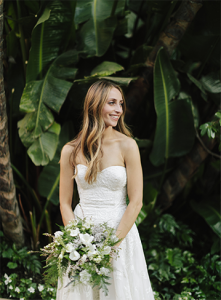 Jenna and Eric’s wedding joined two coasts together for a modern take in a classic venue. 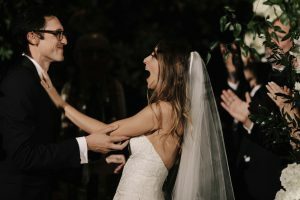 Jenna—an LA native and Eric—a New Yorker from the heart of Manhattan are a jet setting couple who met in college while studying abroad in Paris. 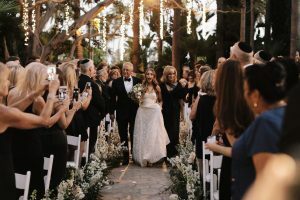 The two have since traveled the globe together but decided to gather their family and friends together on the west coast to celebrate their marriage. 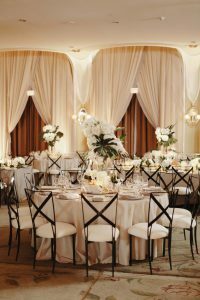 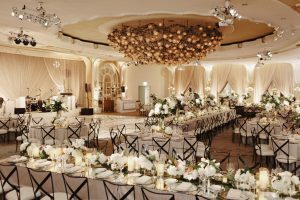 Using the Beverly Hills Hotel as the design inspiration, the scheme incorporated a muted palate with pops of texture and bold tropical-inspired florals: a nod to the grounds at the hotel itself. 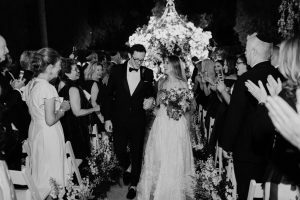 Jenna wore a custom Naeem Khan gown which she collaborated on with the designer himself (Naeem’s son served as a groomsman in the wedding), while Eric chose a sleek Prada suit—a look he collaborated on with his mother—the former the Senior Fashion Editor for GQ Magazine for 28 years. 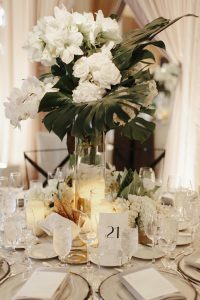 The floral concept for the day built from a garden-inspired ceremony setting, accenting the already beautiful space with lush installations of white delphinium and twinkling lights suspended from the trees above; and bold tropical-infused floral installations on the tablescapes, grounded with sleek muted velvet and taffeta linens, glass vessels and chargers and black chairs. 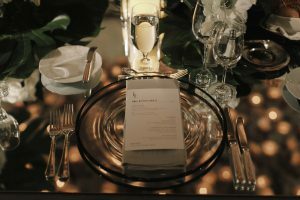 Guests were treated to a menu filled with J & E’s favorites, including seasonal chestnuts, truffles and figs, and capped off the night with a decadent dessert station with petit fours, and topped off the night with In’n’Out style burgers tray passed on the dance floor. 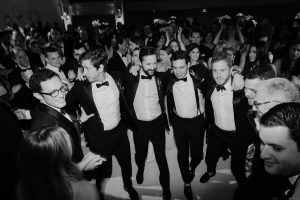 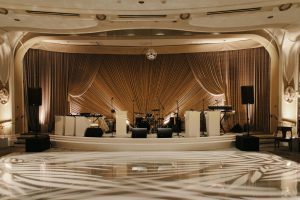 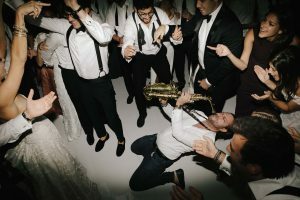 A 14-piece band entertained guests with a curated mix of Motown and R&B throughout the evening, while the couple’s favorite from their travels abroad: Natty Rico, capped off the night with a DJ/Sax hybrid performance into the wee hours.